A hamlet in the parish of Islington, Newington Green contains some of the oldest brick houses in London. 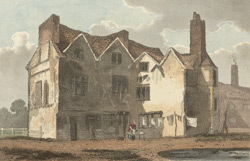 Pictured here is an old house, claimed to be a former residence of Henry VIII. The King is thought to have had a hunting lodge here.